ISP Secondary School is bilingual school that has been awarded the status of Paritaria School with ministerial decree no. 241 of 26-06-2012. 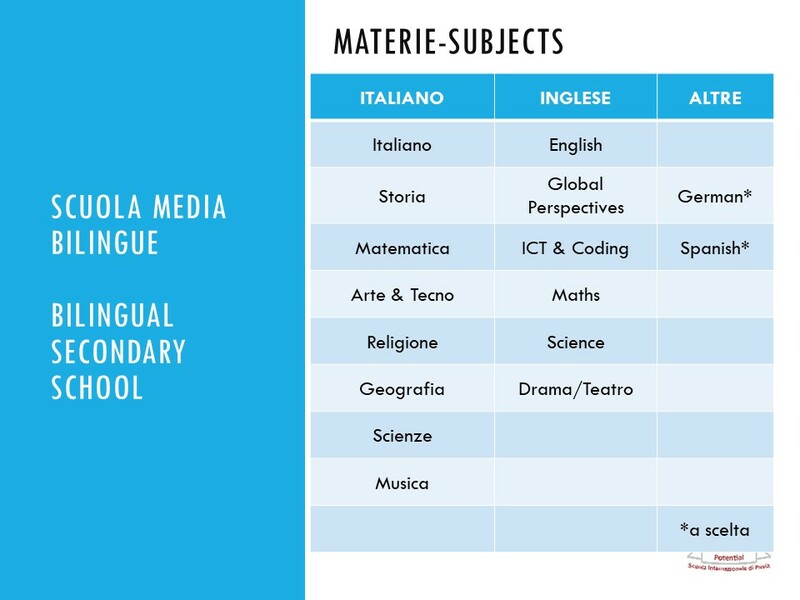 Studies are delivered in both Italian and English, and Spanish is also taught. 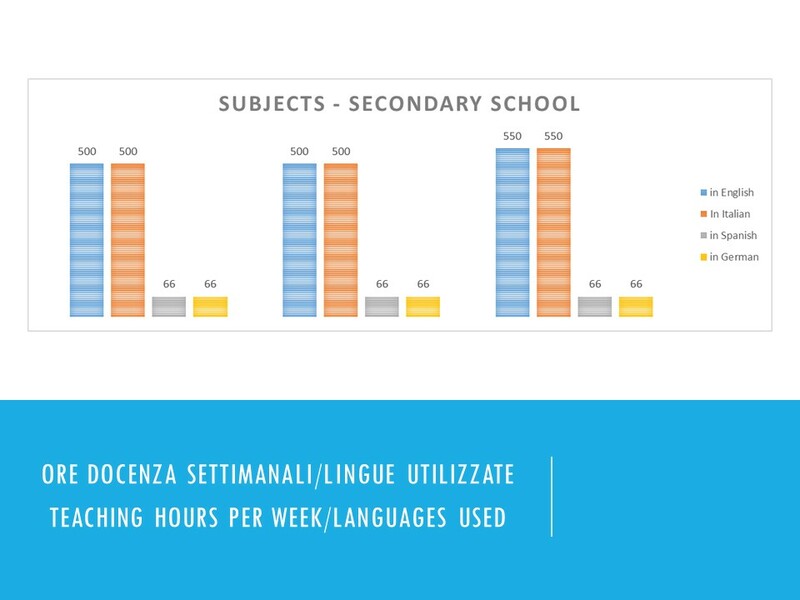 The chart below compares the hours of instruction in Italian compared to foreign languages. School Psychologist available for families. 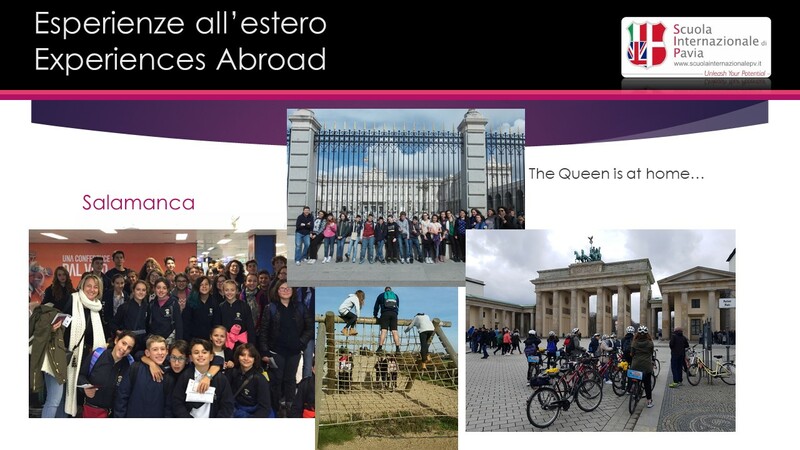 Teaching objectives relate to the international certification of curriculum languages studied, in addition to the optional German language. 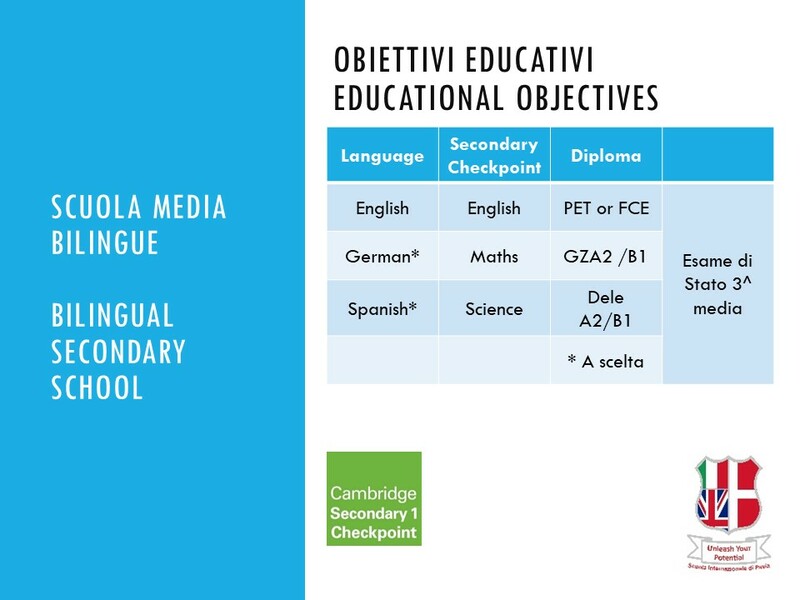 Other examinations concern the Cambridge curriculum and are related to subjects studied in English. 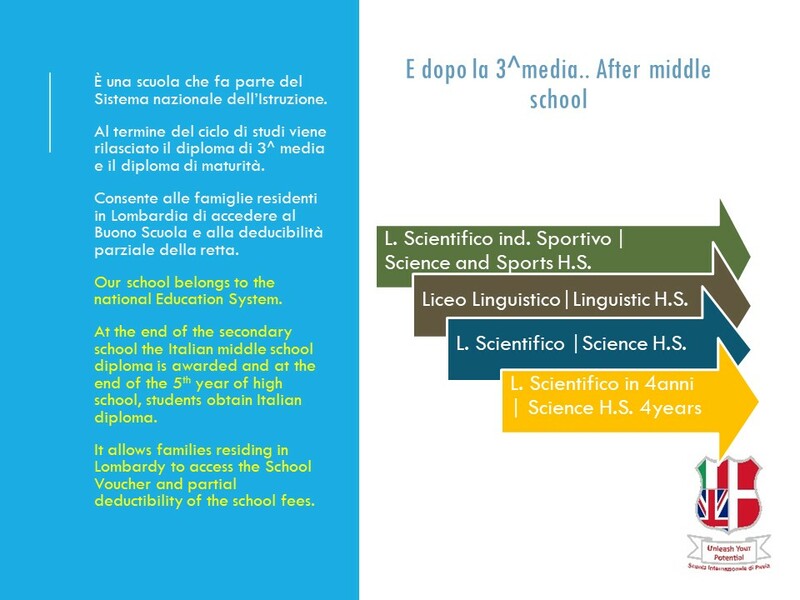 The first grade of Secondary school plays a decisive role in the transition of young teenagers. It must follow the transformation of students ending primary school who are still children, into empathetic and responsible adolescents. Children who would listen to what they were told in primary school, now constantly question what is proposed to them, requiring explanations. A school must not disregard this need of curiosity, but embrace and mould it, giving it purpose and meaning. The school must encourage the development of passionate reasoning, the capacity to know and attest the sense of things, urging all to use their freedom and initiative. A school, that pays attention to the growth of the individual, must have an extremely flexible educational and organisational setting. An OPEN SCHOOL that ensures the presence of teachers during the afternoon time slots, who are ready to assist students with the re-working, recovery and expansion of the subject matter. Workshops for detailed study and consolidation are optional. Meals: Children will have lunch at school with their teachers, and dietary requirements can be catered for. 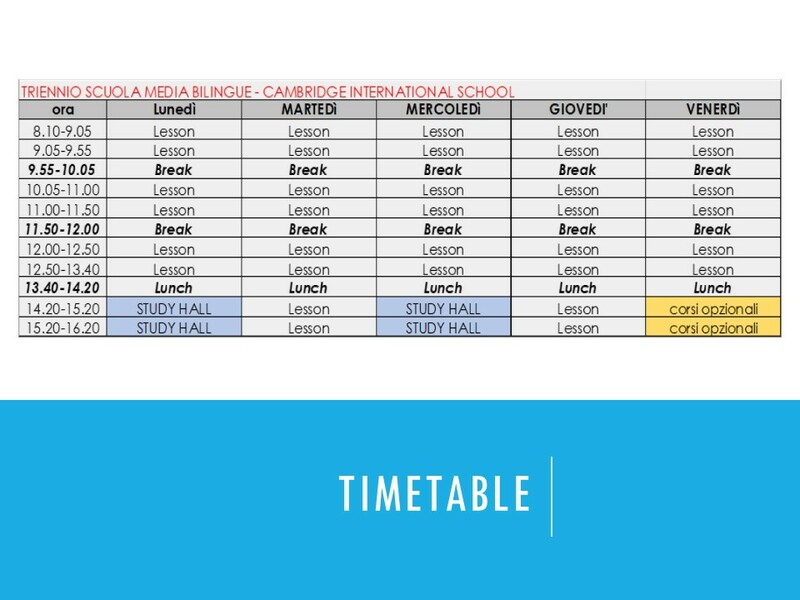 Please complete the enquiry form if you would like any further information or you would like a copy of the school timetable and subjects available..